"The Standard Insurance Company" was a subsidiary. By 1906 Aetna had a branch office in New York City and one in Fort Wayne, Indiana. Aetna was a major lender to farmers in the midwest. Clarence Frank and Minnie V. Kryder, built a midwestern farming, realty, and insurance empire during the Great Depression and World War II which disappeared in Fort Wayne Indiana financial institutions sometime between 1950 and 1966. By an odd Deed, the Law Firm of Barrett and McNagny occupies "The Standard Building" former site of the Lincoln National Life Insurance Company, Anthony Wayne (Summit) Bank and the Kryder realty, construction, and insurance offices in Rooms 215 E. Berry Street, Fort Wayne, Indiana. Photo ID: 00002533 Collection: Historic Photos Notes: COUNTING ROOM, INDIANA GENERAL AGENCY AETNA LIFE INSURANCE COMPANY, CHARLES W. ORR, MANAGER, 1906. Photo ID: 00002518 Collection: Historic Photos Notes: 1. OFFICE OF CHAS. W. ORR-INSURANCE. THE AETNA LIFE INSURANCE CO. OF HARTFORD, CT IS THE SECOND OLDEST LIFE INSURANCE CO. IN THE U.S., HAVING BEEN CHARTERED IN 1820. FOLLOWING THE OLDEST CO., THE PRESBYTERIAN MINISTERS, FOUNDED IN1759. THE AETNA HAS PAID POLICYHOLDERS THE SUM OF $233,131,650. ON JANUARY 1, 1913, THE COMPANY'S ASSETS AMOUNTED TO $110,523,775. 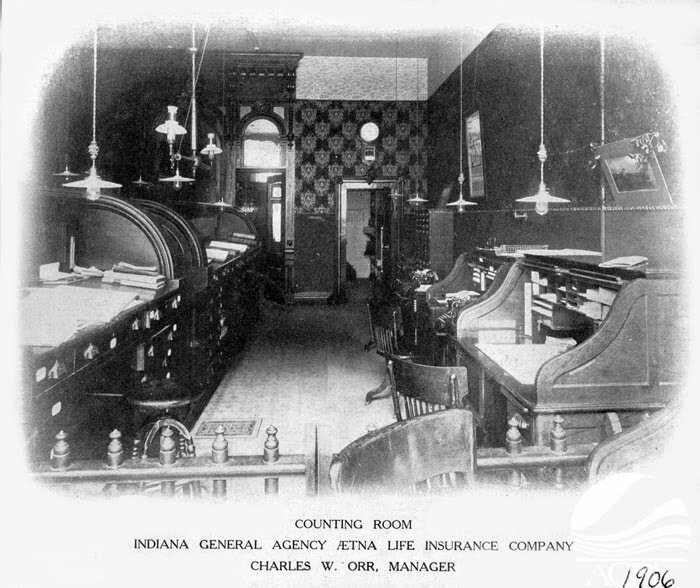 THIS COMPANY WAS A PIONEER IN THE PRACTICE OF LENDING MONEY TO INDIANA FARMERS, AS WELL AS TO THOSE OF THE MIDDLE WEST, THUS HELPING TO DEVELOP THE COUNTRY, IT NOW HAVING MORE THAN 8,000,000.00 INVESTED IN THE STATE OF INDIANA, WHICH REPRESENTS ABOUT $800 OF INVESTMENTS TO EACH $1000 INSURANCE IN FORCE IN INDIANA. THE AETNA HAS ALWAYS BEEN A PIONEER IN THE LIFE INSURANCE BUSINESS, HAVING YEARS AGO VOLUNTARILY INTRODUCED NUMEROUS POLICY FEATURES FAVORABLE TO POLICYHOLDER, THAT COMPETITION NOW DEMANDS OF ALL COMPANIES. THE AETNA'S INDIANA GENERAL AGENCY IS LOCATED AT 132 E. BERRY ST., WITH MR. CHARLES W. ORR AS MANAGER.